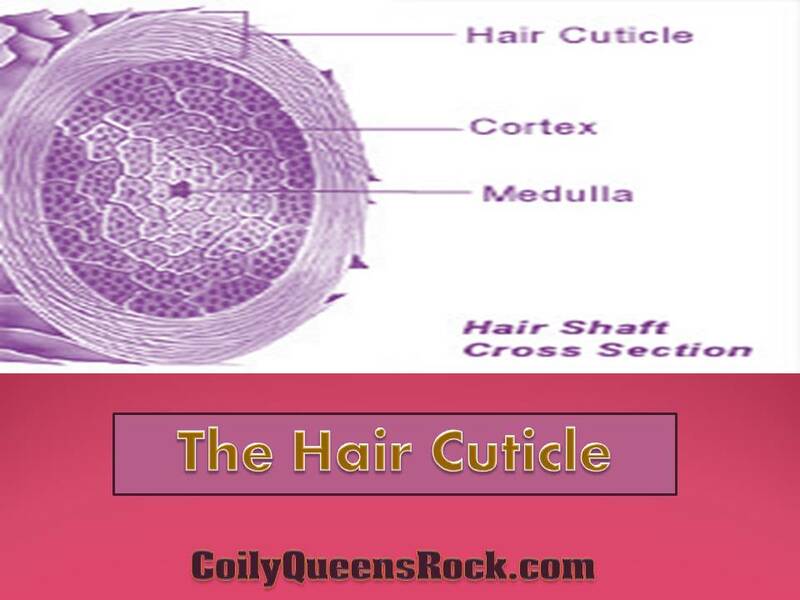 CoilyQueens™ : What you need to know about the hair cuticle. What you need to know about the hair cuticle. The hair cuticle is the outer layer of your hair, the part you see is the cuticle. The hair cuticle is made of layers, which resemble fish scales. The hair cuticle is made up of dead cells. The hair cuticle is protection for the inner cortex of your hair, which is softer. The hair cuticle never closes. No product can be truly sealed into your hair. The hair cuticle can only be made to lay flatter. The majority of products you use, only lay on top of the hair cuticle. You do not want a lot of products reaching the inner cortex of your hair. Water can penetrate all hair. Because all hair is porous. No matter if you think you have low porosity hair or not. Heat makes the hair cuticle open more. Cold makes the hair cuticle lay flatter. Once the hair cuticle is damaged it cannot be corrected. It can be temporarily repaired. Heat from flat irons, straighteners and blow dryers.